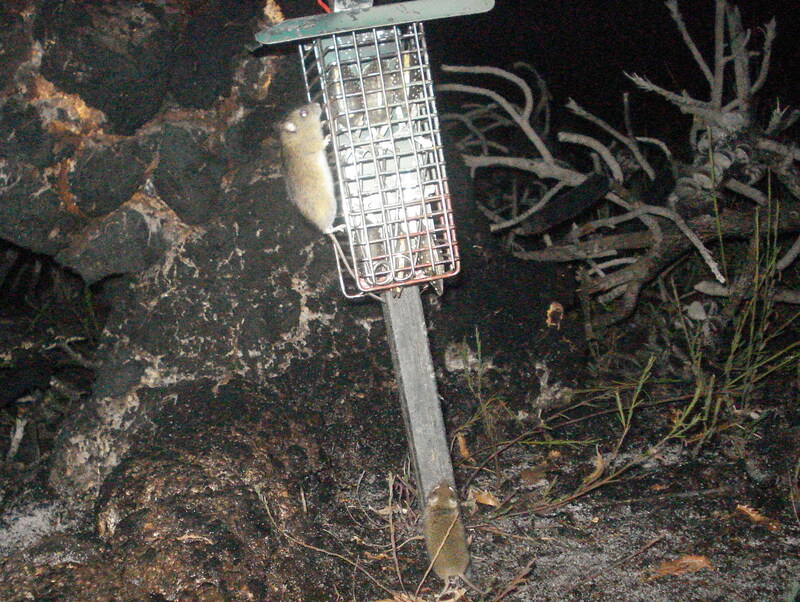 The New Holland mouse (Pseudomys novaehollandiae) is one of Victoria’s threatened native rodents. The charismatic little species has only been recorded from 3 areas across the state in the past 15 years (blue dots in map below) whereas historically it was recorded from 10, including metropolitan Melbourne (red dots in map below). That’s why I’ve embarked on a PhD to determine the status of NHMs across Victoria, and help protect this species from further decline. 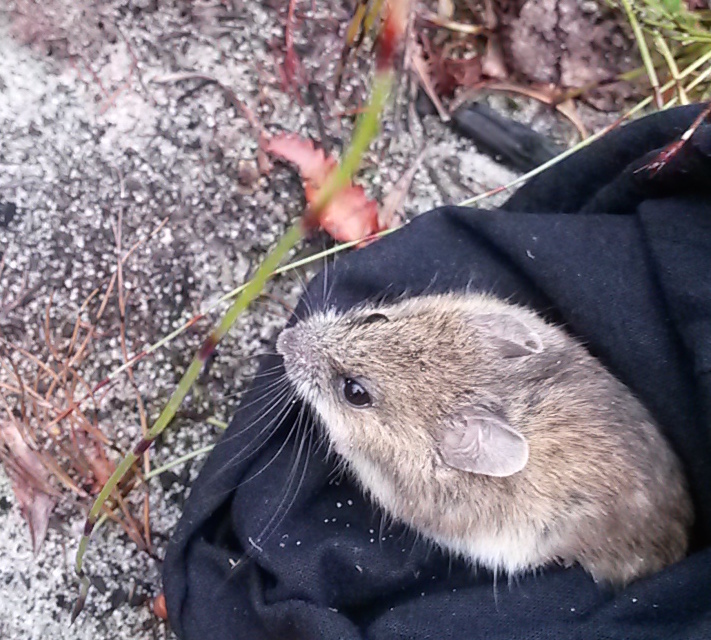 New Holland mouse (Pseudomys novaehollandiae) detection sites across Victoria. Red dots indicate sites in areas where the species has not been detected in at least 15 years, blue dots indicate areas with more recent detections. Dates show the range of years during which New Holland mice were known at each site. One of the greatest challenges for studying the status and conservation of New Holland mice (and many native Australian rodents) is that they can be very difficult to find; you can’t just see them in your binoculars or hear them calling in the bush. 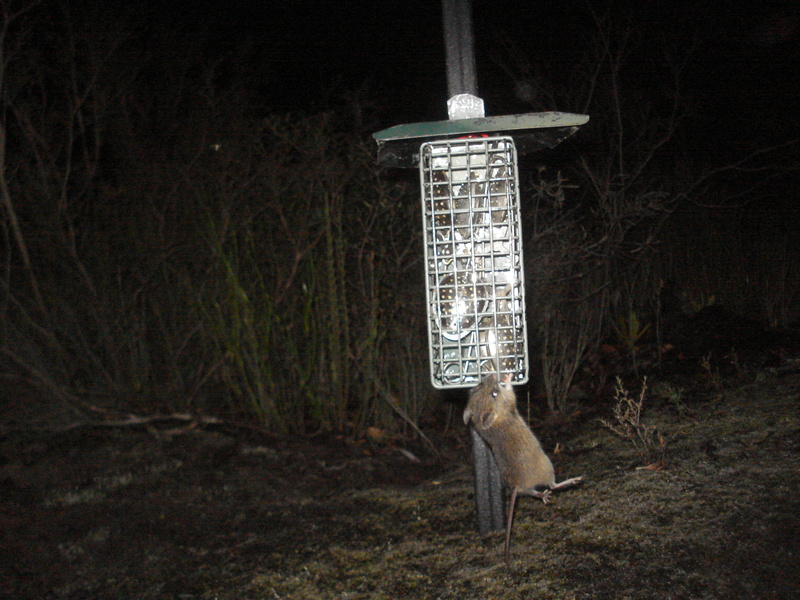 Adding to the challenge – many native rodents, including NHMs, go through natural periods where they persist in such low numbers that traditional survey efforts such as live trapping fail to detect them. New Holland Mice are also particularly fickle about their habitat preferences and may only persist locally for a few years before moving on, making their populations even more difficult to track. That’s why I’ve been trialling the use of cameras to detect the New Holland mouse. Traditional live trapping can be a great method for detecting a species in an area, and it’s critical if I want to know about health and reproduction, estimate abundance, or get DNA samples. However, sometimes when a species is at low densities it takes a huge amount of effort to be reasonably confident that the species isn’t there, which in a world of limited time and funding drastically reduces the area you can survey; a real challenge when a species moves in the landscape. This is where cameras can come in handy – you set them once and rather than having to come back every morning and afternoon to check each trap, you can just leave them in place for weeks at a time. The animals are attracted to a tasty lure (I like to use peanut butter, oats, golden syrup and vanilla essence) and while they investigate, the camera senses the heat and motion and snaps a photo. Cameras allow you to survey much wider areas, for longer periods of time with a fraction of the effort of live trapping – at least until you have to sift through the images and identify the animals. Once I know that NHMs are present in an area from the camera trapping, I can target those areas for live trapping to collect the rest of my data. My challenge, and the reason I did a camera trial, rather than just jumping straight into using cameras as a survey method, was identifying New Holland mice in the images. Rodents tend to look very similar on camera, particularly if the images are in black and white. It doesn’t help that New Holland mice are about the same size as the non-native house mice (Mus musculus); they can be hard for some people to tell apart when they are holding them in their hand. Since the house mouse has infiltrated all known New Holland mouse habitat in Victoria I needed to tell them apart from less than perfect images in colour and in black and white. Tens of thousands of images later, I can happily say that New Holland mice and house mice are distinguishable on both colour and black and white images. In the colour images the species can be distinguished by differences in colouration, but in black and white the distinction is all in the shape of the two rodents. New Holland mice have a much sturdier build, thick set neck and snubby nose, whereas house mice are much more slender with a pointed nose; sort of like the difference between rugby and footy players. 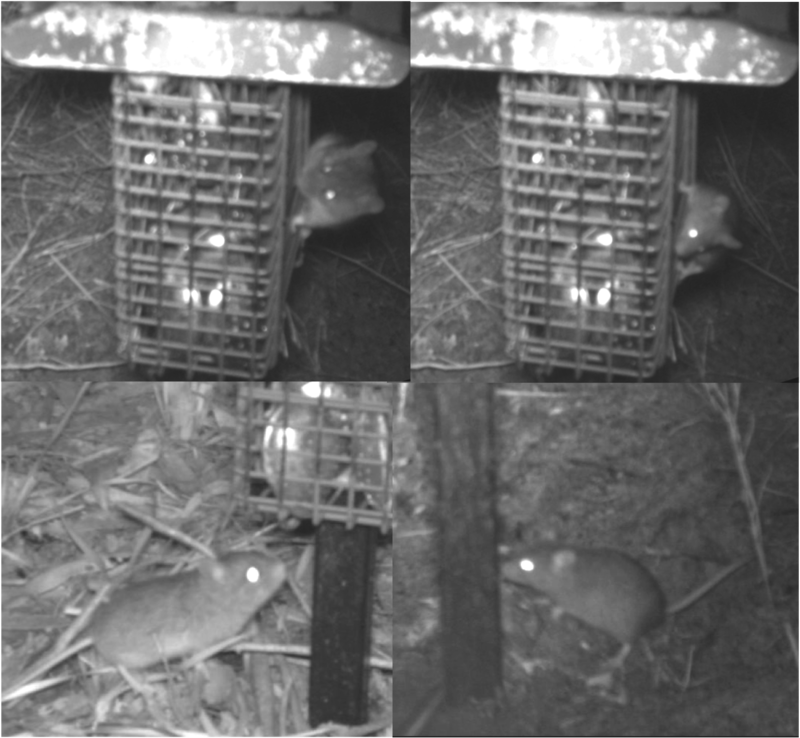 Now that I’ve got the IDs sorted, I’ll be using cameras (and live traps) to survey across Victoria and see where the New Holland mouse is persisting so that we can do our best to halt the species’ further decline. Can you ID a New Holland mouse? Have a go with my quiz! I fill my tea strainers with peanut butter, golden syrup, vanilla essence and oats. The bait stations are modified cutlery drainers with a modified ant cap roof and a plastic garden stake. Having elevated bait stations like this is really only necessary if you need good profile shots to distinguish between similar small mammal species, or require particularly durable stations. They’re fairly labour intensive to construct, so you may want to look into easier solutions – small conduit tubes with air holes, tied to posts are quite popular, but are likely to be eaten through and have the bait stolen if you’ve got any large rodents in the area. Apologies for the delayed reply – I only just ran across this post whilst researching who was using my bait cage design!! I designed this bait station system about 10 yrs ago whilst working at an environmental research institute (ARI) in the Victorian government, Australia. It is made out of cheap, readily available parts from retail shops (at least here in Australia) – the only custom part is a piece of aluminium (aluminium bar from metal suppliers) cut to size as the back wall of the cage. The system was designed to be robust enough to be used repeatedly/indefinitely without repair i.e. to handle abuse by both herbivores and carnivores. The only damage I’ve seen them suffer is from human misuse (usually from being put together incorrectly) or being leaned against by cows or deer. I’ve made hundreds (if not thousands) of these. Perhaps slightly more labour intensive to make than other systems (perhaps) but more robust than others I’ve seen and certainly cheaper than anything else as strong. The cage elevation allows the bait scent to drift/blow further afield (for animals with larger home-ranges) rather than settle along the ground surface like ground pegged systems, and minimises obstruction of the view of smaller animals (i.e. at ground level they can only hide behind the narrow pole not the wider cage). Similarly the open cage was intended to allow more scent circulation than that provided by holes drilled in plastic containers/pipe. The cage also allows for different bait types. The cage is height adjustable to allow for different size animals and depth of substrate penetration of the pole. Sil, Happy to provide further details, photos, measurements, etc if you are still looking for ideas. Or details to you Phoebe for Methodolgy write-up in reports etc if needed. Good to see you using the proper trea-infusers, and 6 of them not 4! Thanks for your guidelines and rationale – great to know about the system’s development. More importantly, thanks for making them all! I’ve been getting a lot of use out of them and really appreciate the effort that must have gone into their construction, I’m really grateful that I’ve been able to borrow them form ARI ready-made. The elevated cages have made my small rodent IDs so much easier, producing fantastic profile shots. Quite excited to find your site. We live in Blairgowrie (MP) and this morning I noticed a cowering rodent in the corner of my garden. I at first thought it was ill as it barely moved on my approach. Then I noticed it’s extraordinarily long tail and its rear feet structure brought to mind a marsupial. I gently picked it up and placed it into the security of a log pile, (as we have 2 dogs). I have taken two very good pics and from these found info on the web and identified it as a NHM. I would love to send you the picks and from what I gather it’s rare and exciting proof they are on the Monington Peninsula. I’d love to see the photos! It would be great to have evidence of NHMs persisting on the Peninsula.